Here are 8 ways to prevent fires while cooking that you probably didn't know. Plus how to put out a grease fire the right way. After seeing the devastating demise of Jack Pearson on "This Is Us" due to a kitchen appliance, fire safety in the kitchen feels more important than ever. The moment that old slow cooker burst into flames brought the terror of a house fire into viewers' homes across the country. Instead of throwing out the slow cooker, brush up on kitchen safety tips from fire safety experts. 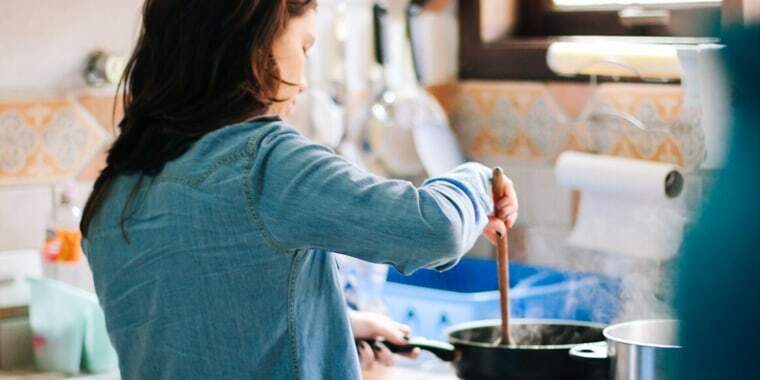 Here are eight simple tips for avoiding kitchen fires and what to do in case one starts. Never putting metal in the microwave is something many people know and understand. But it's important to be aware of unexpected items that may contain metal too. In addition to utensils and aluminum foil, twist-tie wraps used to store food or bread can ignite in the microwave, according to Massachusetts' Public Fire Education Department. When removing food or liquids from the microwave, use pot holders or gloves. Use extreme caution because even a minute or two in the microwave can make foods and cooking vessels much hotter than expected. If a fire starts in the microwave, turn off and unplug the appliance, do not open the microwave door and call the fire department immediately instead of waiting to see if it gets better. 2. Stay in the kitchen while cooking. Fires begin most often when what whatever is cooking gets too hot, according to the U.S. Fire Administration. That's why it is essential to always stay in the kitchen and keep an eye on what is cooking. If you notice smoke or the grease begins to boil, turn off the burner immediately. If you have to leave the kitchen — even momentarily — also turn off the burner. 3. Pay attention to the placement of handles. When pots and pans are on a countertop, always turn the handles away from the edge. When they're placed on the stovetop, the handles should also face the back so no one can knock them over accidentally. Enforcing a "3-foot child-free zone" around a stove is another top tip from the U.S. Fire Administration. This is smart to do with pets also. After using any kind of slow cooker, electric skillet, toaster, toaster oven, pressure cooker, deep fryer or Instant Pot, make sure to unplug the appliance after use. Get a Jack Pearson decal if necessary as a reminder. Also, never use appliances with frayed cords. Appliances should always be plugged directly into outlets and never into extension cords. 5. Become a deep frying expert before breaking out the oil. Using deep fryers at home to make foods like deep-fried Thanksgiving turkey has become increasingly popular and increased the number of fires caused by the appliance, which peak on Thanksgiving Day, according to the USFA. Deep fryers can tip over easily, the hot oil splatters easily (especially when frozen food is placed inside) and the oil can overheat so much that it starts a fire. In order to stay safe, the U.S. Department of Agriculture's food safety department has several pieces of advice. First of all, always read the manufacturer's manual for how to use the deep fryer and keep a fire extinguisher nearby. Before filling the fryer with oil, maker sure the appliance is turned off, wiped dry and not near any water. Never overcrowd the frying basket and do not touch it or add food while the basket is submerged. Again, never, ever leave it unattended. A deep fryer works very quickly and the potential for fire hazard increases when the food gets overcooked. See TODAY FOOD's guide to deep frying at home for more in-depth tips about how to use a deep fryer safely. 6. Keep these four items handy while cooking. A large pan lid, cookie sheet, baking soda and fire extinguisher should always be easy to get to in the kitchen. Rearrange things in the kitchen if necessary to have easy access to these items that can help stop a fire from spreading. 7. Never throw water on a grease or electrical fire. While it may be a natural inclination to extinguish a fire with water, grease and electrical fires are different. If food catches on fire due to grease, quickly place a large pan lid or cookie sheet to suffocate the flame and keep the fire from spreading. A large amount of baking soda can also help to put out grease or electrical fires. 8. Wear short sleeve tops and roll up long sleeves. If any clothing catches fire, stop, drop and roll immediately to put out the flames. If any burns are apparent, follow the Center for Disease Control's guide for assessing and treating burns, and call 911 for help. No matter what, do not put butter or ointment on the burn.